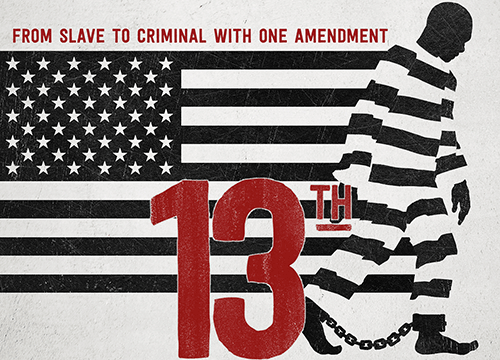 Taking its title from the 13th Amendment to the US constitution, this BAFTA winning documentary from Selma director Ava DuVernay offers a devastating analysis of race and the law in the USA. The 13th amendment outlawed slavery but had a crucial caveat: “except as a punishment for crime whereof the party shall have been duly convicted.” This meant that once the civil war was over, former slaves could be arrested on trivial charges like vagrancy and loitering and turned into prisoners, and just like that…they were slaves again. DuVernay’s contention is that this loophole continues to be abused to this day; that the psychodynamics of slavery, and the economic logistics of it, have never gone away. Populated with eloquent talking-head interviews and well-sourced archive material, DuVernay draws a strong, straight line from the abolition of slavery through the chain gang labour that replaced it, through segregation and the mythology of black criminality, to the war on crime and the war on drugs – rightly recontextualised as a race war – to the rise in mass incarceration and the big business of prisons. Densely packed with ideas and truly shocking facts and statistics, this is a fiercely intelligent, powerful and timely film that we urge you to watch.